One of the most common impairments resulting from stroke is paralysis, which can affect a portion or the entire side of the body. Problems with body posture, walking, and balance can be significant. 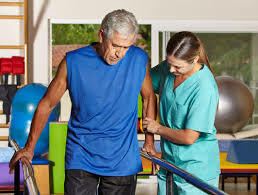 A patient’s rehabilitation should start as soon as he or she is stable. That could be anywhere from a couple of days to a few weeks or longer. Established guidelines, as well as a huge body of literature, insist that the earlier therapy is initiated the better. Neuro Rehab Products. What’s right for me? Listed below are various clinical product categories that you may have learned while in therapy. Feel free to click on any category to see a list of products that may be appropriate for your needs. Studies have shown that stroke survivors are twice as likely to fall following a stroke and more than three times as likely as the general population to fall multiple times. About 40 percent of stroke survivors have serious falls within a year of their stroke. Recovering from a stroke can be quite challenging from both a psychological and physical perspective. In addition to completely experiencing a life-changing event, staying motivated with a daily intensive home exercise program can be a struggle. Once a client is discharged from the hospital, it will be important to maintain or improve their recovery by beginning an aggressive home exercise program immediately.